Deptford's 4x400m team pulled them through to a state team title. Distance running talents Chris Romero of Voorhees and Devin Hart of Pt Pleasant Boro doubled the 1600m and 3200m head to head and both races came down to the line. In the 1600m Hart, Romero, and Haddonfield's Derek Gess took off from the field a little over midway. The final laps turned into a two wide kick between Romero and Hart with Romero edging him out at the line by .03 with a time of 4:16.57 (watch the full race here). They would both double back in the 3200m and Hart would return the favor winning that race in similarly close fashion with a time of 9:25.74. 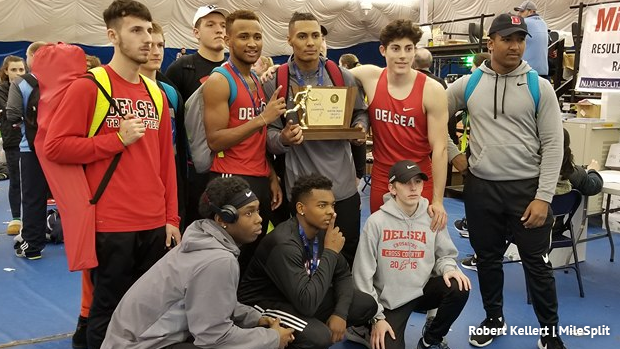 Two talented Group 2 squads went home state champions, Delsea and Deptford both completed Friday's events with 36 points each. It came down to the 4x400m, Delsea had a 34 to 30 lead going into the last event and both teams knew what was at stake. The catch for Delsea was that they were running in the second of four heats, no matter as they ran a 3:23.13 which was good for fifth after the following sections finished. Deptford ran in the final fastest section and with Delsea's time on their mind they also got the job done placing third with a 3:28.55 gathering the minimum 6 points they needed to match. Among their point scorers Delsea had four second place finishers: Michael Szwed 50.40 in the 400m, Keon Grady 6-0 in the high jump, Nico Morales 14-0 in the pole vault, and Bill Goldsborough 56-07 in the shot put. For their full team breakdown view here. Deptford saw Khion Smith take second in the 55m dash running 6.61, Naseem Smith second in the 55m hurdles 7.73 with teammate Javon Sanders right behind in third 7.79, and their two high jumpers Marcel Washington and Tyrece Brown placed third and fifth at 6-0 and 5-10. For their full team breakdown view here. Sophomore Malachi Melton of Cedar Creek won the 55m with a time of 6.58. 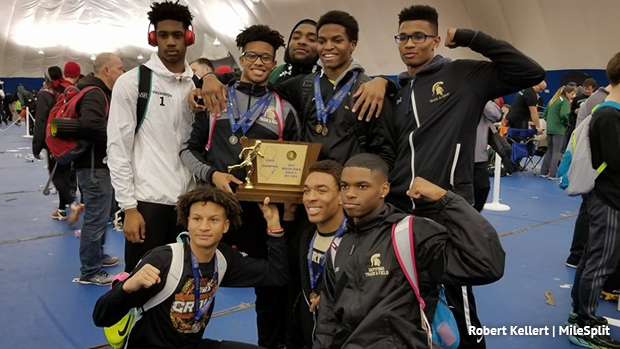 Rahway saw two gold medals with Marvin Polynice winning the 400m at 50.39 and then also taking part in their first place 4x4 squad which ran 3:28.22. West Side's Isaiah Greene put up a NJ#2 time to win the 55 hurdles at 7.41. Matawan's Dylan Lopresti cruised to a 1:59.07 victory for the 800m. Fort Lee's Emanuel Montoya cleared 6-0 for the high jump title. Liam Landau of Pascack Hills had a major PR of 14-06 to win the pole vault, his previous 13-08. Kamron Kobolak of Cinnaminson threw 57-09 to win the shot put. Matthew Tomaino of Pt Pleasant Boro posted a 20.15 and 2:10.57 in the 55m and 400m wheelchair events.